Pétanque started in the South of France in 1907 and now millions play this most popular version of boules worldwide. 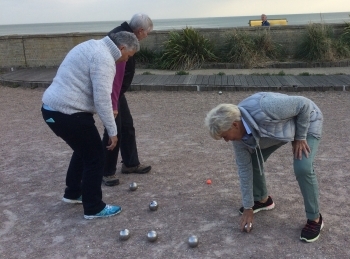 Pétanque is an extremely inclusive sport that can be played equally by both men and women irrespective of age, physical fitness or ability. Everyone is welcome to come along. We are a friendly group of people who enjoy playing the game, and then having a social drink at a local LGBT friendly bar. The full season will start @ 6.30pm on Thur 2nd May. 7 members are already going. Sign in to see who they are and add your name. The basic rules are simple and easy to learn. However, pétanque is an exciting, skilful and highly tactical team game, although luck often has a part to play. There is no need to sign up, just turn up at the Petanque terrain, by The Meeting Place Cafe. All equipment is provided, and we charge £2.00 per session. If you have not played before we can support you with rules of the game and general encouragement. Your first session is free, after which you must join BLAGSS in order to play again.